Winter time is the best for cuddling, and with Lookin' Good's Holiday Dog Pajamas your pet will be doing plenty of it! These soft, adorable PJs are made of a super comfy poly/cotton blend, with cute Santa, reindeer and Christmas tree patterns to get your furry friend in the holiday spirit! 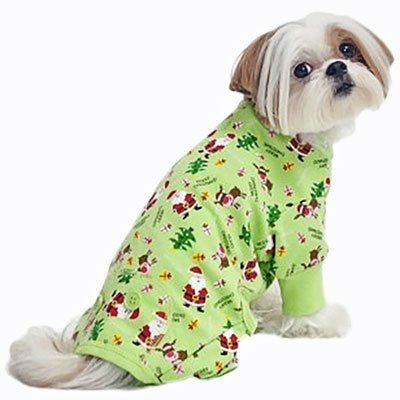 These pajamas' bright green color and holiday patterns make a fun, adorable way to highlight your dog's personality! We carry a wide selection of dog sweaters, coats and costumes. Feel free to browse until you find the perfect outfit for your pet! Washing Instructions: 65% polyester, 35% cotton. Machine wash cold with like colors. Do not bleach. Tumble dry low. Do not iron.